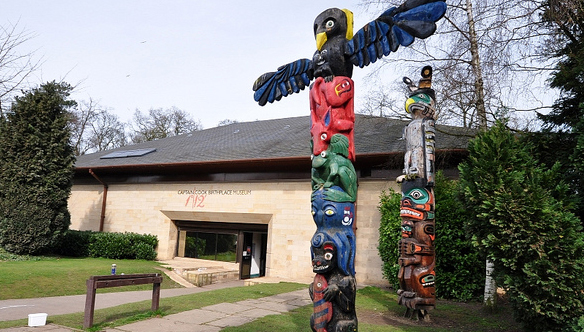 The Captain Cook Birthplace Museum marks the site of Cook's birthplace in Marton on the outskirts of Middlesbrough and is situated in the beautiful landscaped grounds of Stewart Park. Outside a traditionally carved Nootka totem pole from Canada guards the entrance. The museum tells the story of one of the world's greatest navigators and mariners through themed display galleries, temporary exhibitions, associated activities and events and a lively education programme. There is full disabled access throughout and additional facilities such as the Discovery Room (education & activities), the Endeavour Room (meetings & events), the Resolution Resources Room (archive & research), gift/book shop, and a cafe. The exhibit of James Cook's early life gives a unique insight into Cook's early days at Marton, Great Ayton and Staithes to his early seafaring career at Whitby and joining the Royal Navy. The Endeavour and Resolution displays show the three great voyages where Cook and his crew encountered many new peoples and lands. Artists and scientist recorded the strange plants and animals of the South Seas and Americas. Discover the creaking of the timbers below deck and the perils of the ocean. Launch yourself back into Cook's time through the Endeavour Shuttle. Find out how to provision Cook's ship for 100 men for 3 years. How many barrels of rum do you need to take? What is portable soup? And what were Cook's secret instructions? The Museum is for anyone of any age looking for an account of life 200 years ago, a grasp of what it was like to sail around the world and, above all, adventure. A voyage of discovery for the whole family.